I promised myself early on I would not let my upcoming Fall wedding be filled with drama or any stress. What I learned is that is nearly impossible no matter how hard you try. But, there are still some helpful tips below to alleviate completely losing your sanity during wedding planning. Book your venue before anything else and book early. Places book up a year in advance sometimes. 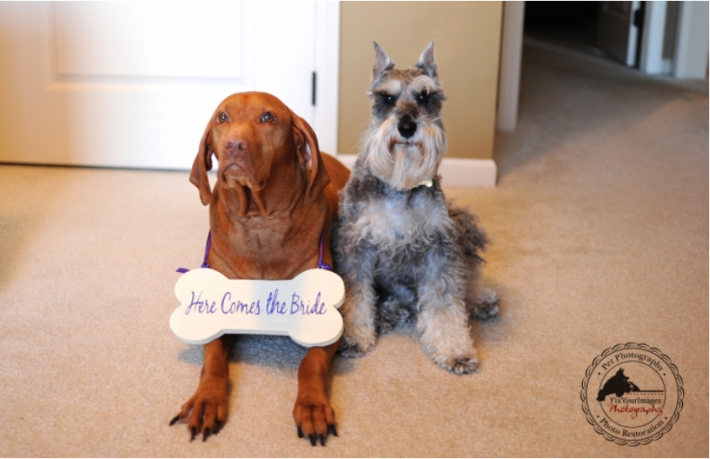 Hire a dog walker/pet sitter if you plan to have pets in your wedding. I can’t imagine being able to keep a watchful eye on our dogs myself and still remain relaxed and calm. Make a list of monthly to-do’s and stick to it. At first I tried to do every possible item on my agenda immediately but found that breaking items down by month made everything seem so much more manageable. Get everything in writing and read contracts thoroughly. Check out Pinterest and Etsy! If you are crafty yourself, Pinterest can be your BFF. If you aren’t so crafty or don’t have the time, Etsy has amazing and reputable artists who can create anything you could imagine. Go with your gut. For example, if you love a wedding dress the minute you put it on – then don’t question yourself. It’s “the one”. Try to do everything yourself. I am Type A and a complete control freak. Atleast I can admit that! My fiance’ wanted to be involved in the planning which is wonderful – so take the help and let go of control. Choose friends as your vendors. I had a photographer and a DJ who both cancelled on me. One was a friend and the other was referred from a friend. Surely I could trust them! Both ended up causing me more stress by cancelling and I had to scramble to find someone else before everyone booked up on our wedding date. Sweat the small stuff. Is anyone going to remember the color of your linens or even the food they ate at your wedding? Probably not. Hire an amazing photographer and make sure you are happy with your dress and that’s all that anyone will remember – is what is preserved on camera. Worry about offending anyone you can’t afford to add to your guest list. Consider having a large shower or separate celebration to include additional folks that don’t make your guest list. They will still feel included in your festivities without totally breaking your budget.